Alright so this clock does look a touch different and it’s bound to get you some strange looks, but this has to be the most brilliant design I’ve seen lately. Digital bedside clocks are always designed to be easily readable when you’re sitting up looking squarely at the clock, which is ridiculous once you think about it. This clock is made so that you can easily read it while laying in bed on your side. Plus this clock has the perk of being mounted to the wall, that in turn will free up space on your end table. It’d be especially great for those that don’t actually own an end table. 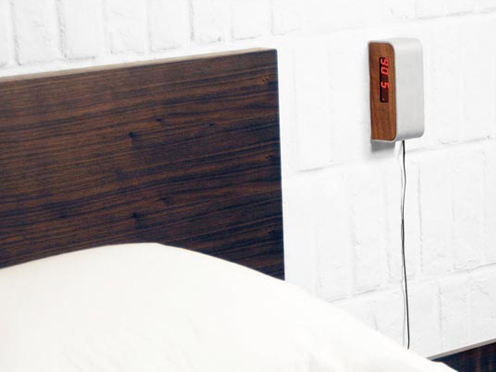 The LED clock has all of your normal alarm functions, as well as being able to mount on the wall sideways. It’s made out of 5/8” walnut wood construction with brushed aluminum casing. You can purchase the Emily Alarm Clock for $129 from Generate, which admittedly is definitely pricey.